Berkshire walk with wonderful views from Gallows Down and Walbury Hill. The walk also explores the countryside and villages lying north of the chalk escarpment. A GPX File is available for download (see walk description). 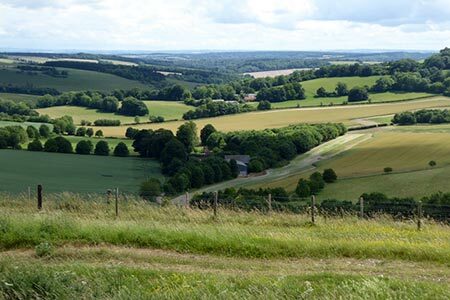 30 walking routes exploring the North Wessex Downs Area of Outstanding Natural Beauty (AONB). The routes are between 7km to 20km through this peaceful rolling chalk landscape covering parts of four counties: Berkshire, Hampshire, Wiltshire and Oxfordshire, with descriptions to reach the highest points in each one.